Astrom Editions AB - Ambelikou Aletri. Metallurgy and Pottery Production in Middle Bronze Age Cyprus. Ambelikou Aletri. 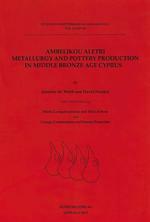 Metallurgy and Pottery Production in Middle Bronze Age Cyprus. Av David Frankel & Jennifer Webb.